Fish is a staple of the Bengal region, so people here have innovated many unique ways of preparing it. To infuse the flavor of a tender leaf into fish, they created the Paturi. Pata is the Bengali word for “leaf” and when the fish is cooked in an envelope of leaves, you’ve made a Paturi. Tender banana or squash leaves are used to cook the Paturi and each kind of leaf lends its own flavor to the preparation. 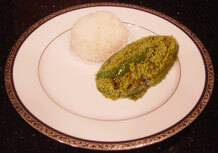 We’ve used the Bengali favorite, Hilsa fish (or Ilish) to make Ilish Paturi. 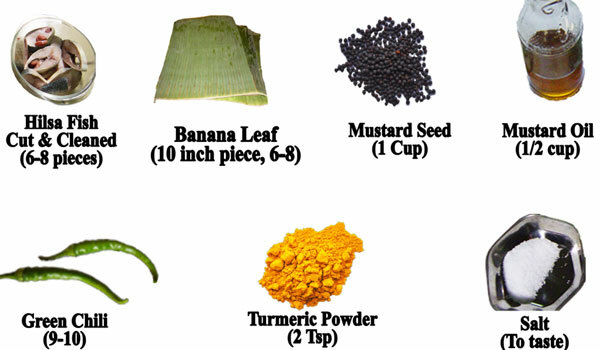 4) On a clean banana leaf, spread one tablespoon of mustard paste, put the marinated fish on top of the mustard sauce and then put another tablespoon of mustard sauce on top of the fish. Pour 1 tablespoon of mustard oil, and then place a fresh green chili on top. Fold one side of the banana leaf on top of the fish and then fold the other end to cover it. Fold the remaining ends to completely envelop the fish. Tie with a thread so the envelop does not open. 7) Heat the pan on a medium setting for about 25 minutes. It is best to open an envelope after about 15 minutes to check the progress and turn the envelopes over. 8) After about 25 minutes, carefully open an envelope. The fish should be soft and flaky.